This entry was posted in Finance, Scarborough RT/LRT/Subway, Transit. Bookmark the permalink. Once again, well done! Is there any way transit can be taken away (from those who do the napkin planning) so it is no longer a political football?? Until it is no longer portrayed as an us versus them, nothing will be done properly. A lot of the constituents never realized that Ford did them a disservice by stating they were streetcars (false), would take away road space for cars (false), and promoting the idea that areas will be ripped up for years with LRT but not subway (true and false). Too bad an imaginary map could not be put together with all routes(system map with all forms of transport,with all connections, new routes, etc.) to put in front of those running, championing the political route of the day (that usually does not make sense). Steve, almost 3 years ago, I went to a class reunion at a restaurant on St. Clair West (won’t say how many years). One of our old classmates was retired from finance at the TTC. At the end, several of us were outside talking about the St. Clair ROW and LRTs. He stated that LRTs were just streetcars. Several of us (including a current councillor) got into a heated debate with him. Ended with us giving him sites to go look up the info as he realized and just assumed that they were one and the same!!!! A TTC person who did not have all the info……go figure. Did you mean “1 stop subway”? Steve: Ah yes, the one stop subway. I will fix the article. Thanks. I see part of the problem with the ability to sell the LRT to replace the SRT is the fact that the SRT has to be shut down for a very long time to replace it. It is why I was initially in favour of the 3 stop Subway. Feeling as hard done by as the folks in Scarborough feel you can’t ask them to live with shuttle buses for years. Perhaps if the Scarborough U of T LRT was built first it would be a show of good faith and would relieve some pressure on the SRT allowing for a more rational discussion of solutions for the other route. As it is 2.9 billion is too much to pay for a tunnel and one stop. Just a reminder that is 2,900 times one million dollars. What is going on? Steve: It is also worth remembering that once upon a time, the Sheppard East LRT was also part of the mix, and would actually be operating by now. This wouldn’t get northern Scarborough riders to STC, but it would improve their access to the subway via Don Mills. Steve, do you think the additional billion could be the tipping point for councillors who initially held their nose and voted for the extension? Is there any political will to finally put the extension to bed? Steve: I suspect this may definitely tip the balance, especially if there is an attempt to raid the budget for the Eglinton East LRT proposed only months ago as part of a grand solution. There is a point where the overall package cannot be sweetened to keep people like Joe Mihevc, who claims he supported it to avoid further wrangling, from propping up a subway at any cost. There are others who owe more to the Mayor, and it will be interesting to see where they turn. Steve I understand much of your frustration but I’m quite appalled by this divisive bully statement coming from someone with your voice I expect it from the Star and Metroland. Whether I agree or not, I do applaud you for usually bringing thought out reasoning to this argument at times. Whereas the others in this one sided media assault haven’t. But statements like and the ongoing assault through the transit rich media (who are far more spoiled than any area of Scarborough) add nothing to the debate expect divide. Steve: Sometimes I have to turn around the sort of language that is used on me and generically on “downtowners” to show just how hurtful it can be. But I do feel that some subway advocates badly overstate their case, to their detriment. It’s not an LRT vs. Subway problem. It’s an integration problem. To think we can’t integrate Scarborough Center seamlessly in a more cost effective [way] is complete rubbish. Scarborough residents have only been able to choose between select Politically biased plans. Surely we can find a REASONABLE compromised solution to bring the key Political players below. And that’s not what’s being done. Matlow – wants to save money for his transit rich constituents by pounding on a segregated LRT network- (Bit of a spoiled group which cries foul only when it’s the suburbs at play… but I get the Politics behind it as the transit blessed core wants more capital for DRL and other projects…..
Steve: Matlow’s constituents won’t benefit from a DRL unless it comes at least to Eglinton, preferably further, because only then will it offload demand on the Yonge line. They are going to wait a long time to see “relief”. Glenn D – wants the vote for getting the best for SCC & see it flourish with the best form of Transit – Make complete sense and by your own illustration the RT doesn’t attract even commuters. Steve: The point I made about the RT was not because of its technology, but because it does not connect most of the homes from which would-be workers at STC would originate. For them it’s not even a capacity issue as they would be travelling counter peak — I know, I used to be one. The subway will have the same failing. Tory – Wants the middle vote but has thrown a wrench with Smarttrack. Needs to let go of Smarttrack and find the compromise. Ford – Wants to collect votes by giving a voice to those without a voice & no Political media megaphone to hi-jack the debate. Remember he was runner up in last election and if Tory loses grip on the SSE Polarization will go to another level in this City. If we can compromise on the above concerns and create some form of sanity we need to find a away to get STC on the subway platform at the cheapest cost and fill the rest will LRT, What would the extra cost be for a surface subway? Obviously it too has challenges and would have some extra costs but I’m sure its worth every penny for the future of this City. Surely we can stop name calling, finger pointing, look at the cost on alternative routes & find an intelligent compromise instead of looking at only the cheapest, or most expensive and most divisive plans. The Scarborough subway needs to be built (with the Lawrence East station readded). There is a significant amount of existing development at Scarbororough Centre and the mall there is pretty successful. I think that the lack of new residential projects there is caused by the bad economy and because the uncertainty about the Scarborough subway discourages developers from building there. I think that the only reason that there is opposition to the Scarborough subway and other subways is inadequate funding. The provincial government is putting tens of billions of dollars into GO electrification. This is coming at the expense of building new subway lines or maintaining the existing subway system properly. If Toronto actually funded its transit system properly, opposition to the Scarborough subway would go away. The Scarborough subway is relatively low cost compared to the DRL Long which is almost $10 billion. Also I think it compares favourably to the Spadina subway extension and the Orange line extension in Montreal. Duguid is a politician — don’t confuse him with the facts! Not to flog a dead horse, but is it really impossible to put a subway along the SRT right-of-way? I know the problem is the tight turn, but would that be resolved if the subway were single track rather than double? That would allow for a slightly wider radius. A single track would surely be adequate, given the ridership projections. And in case Duguid et al feel that a single track is not “world class”, London is currently constructing a single-track extension of the Metropolitan Line to Watford Junction. Steve: The answer is no. And as for single track, that really won’t fix the curve problem, and will add an operational constraint on how many trains/hour could run through to STC. Once again, well done! Is there any way transit can be taken away (from those who do the napkin planning) so it is no longer a political football?? Basically, no. Metrolinx is a crown agency, so if it tries to colour too far outside the box, the Province can change the rules to bring it back in line. The same goes for the TTC and the City. As long as politicians hold the power of taxation, the only limit is their own self-restraint. Generally critics are people who are less than 10 minutes to a subway station from their homes. How is he defining ’10 minutes’? Sheppard and Kennedy is 10 minutes by car from Don Mills station; Ellesmere and Kennedy, Eglinton and Kingston, and the STC are all 10 minutes from Kennedy station. Most people are within 10 minutes of a subway station, so most critics should be as well, unless some actual demographic difference were occurring. If you need to call it a fact, it probably isn’t one. We are the major contributor, and are unwavering in support. Unwavering that a subway be built, but not unwavering in support of the best transit for Scarborough. Wouldn’t the best position for Queen’s Park be: “we’ve provided $2B for transit investment in Scarborough, it’s up to the people on Scarborough and Toronto how best to spend that money”? I suspect this may definitely tip the balance, especially if there is an attempt to raid the budget for the Eglinton East LRT proposed only months ago as part of a grand solution. There is a point where the overall package cannot be sweetened to keep people like Joe Mihevc, who claims he supported it to avoid further wrangling, from propping up a subway at any cost. There are others who owe more to the Mayor, and it will be interesting to see where they turn. It would be great if we could break the veneer on SmartTrack as well by raiding its “funding source”. Do a Scarborough Transit Reset/TransitCity 3.0: Sheppard LRT to Meadowvale (including whatever subway extension to make a better connection), SRT to LRT conversion and extension to connect to UT Scarborough, Eglinton East LRT, and a couple north south routes. By rolling the two elephants together with whatever other relic funded plans (Sheppard transit), you can build a $8B, 7 line LRT network with four subway stops (assuming a DRL on Don Mills to Sheppard) with a future “Phase 2” for an additional $6.5B. Hi Steve, I enjoyed the article. I was wondering, do you know if it is possible to access the detailed budget for this (and other) subway construction projects? I am guessing it would be part of the winning construction bid. I find my mind being boggled by these multi-billion dollar costs and wish I could see the detailed breakdown of costs between materials, design consultation, equipment, labour hours etc. If you know of any way to access this I would be very interested! Thanks for all your dedicated research into public transit. Steve: I have not seen a detailed budget published for these projects, only bits and pieces when things like the Spadina cost overruns happen. This is fascinating! All those commuters living at STC will pile on the subway in the morning to go downtown and in the evening they will take the 6 KM run to get them back non stop to their home at STC. And here I always thought that those people getting on and off at the intervening stations on the existing RT were the ones who wanted the subway. I guess not! That’s part of the reason why I was hoping that Tory was smarter with SmartTrack than he turned out to be. If he had killed the subway extension and pushed SmartTrack’s construction so that everything except the Ellesmere-Kennedy portion was done by the time the RT was to be shut down for the conversion, you could have used SmartTrack in a limited fashion as part of the shuttle service. Granted, this would have caused problems with the LRT over that same stretch to the point of probably needing to move the LRT to Kennedy and the SmartTrack frequency would probably be worse than once every 15 minutes at first. However, it would have lessened the hostility against the conversion. The Scarborough subway is long overdue and should have been built 20 years ago. I was told by a friend who also happens to be a city councillor that it will be shovel ready by the end of this year as they have been working on it for 3 years already and 3.5 years by the end of the year. Steve: No it will not be shovel ready by the end of this year, and that was confirmed at the briefing on June 21 at City Hall. There’s two years more work, minimum, before any construction can begin. They still have not finalized where the line will actually go, for starters. Your friend is misinformed. But statements like [this] and the ongoing assault through the transit rich media (who are far more spoiled than any area of Scarborough) add nothing to the debate expect divide. Scarborough pols made be as idiotic as any other but they have much more of a right to block until we see some type of fair, properly integrated transit BUILT in Scarborough. It’s either Scarborough takes a couple of hacked in LRT lines or becomes the Political pawn again. Build a fair, properly integrated network throughout the City or don’t expect support from those left with scraps. The issue is Scarborough doesn’t have a fair network to make accurate ridership predictions. Like it’s been said here by the DRL fanatics that Greater Scarborough should just be happy they’ll benefit by being closer to quality public transit everywhere else. Although just as Politically pathetic is how the downtown media is trying to use this as justification in their fight to hi-jack the SSE. It’s amazing that the only Political decisions worth the media assaulting occur in Scarborough. Well…. aside from lack of respect from one side of council trying to do everything they can to ensure Scarborough receives the lowest quality & cheapest design possible as they continue their nauseating opposition creating further polarization. Scarborough is not asking for ALL the investment. The SLRT was headed to Markham/Milner & there is no reason a subway cant from a design standpoint. If money can take it further. DO IT. No one from Scarborough is fighting for all the money. We are asking for the money to actually build a connected network. Not a segregated transfer laden LRT hack job. Steve’s comment is that the debate needs to mature beyond ‘wants’, ‘desires’, and ‘fairness’ to where the actual trade-offs are what are discussed. So long as the argument that Scarborough has a moral imperative to receive a subway and any other solution is a form of punishment, then there cannot be a real debate and just an us-vs.-them rhetoric. Scarborough residents have only been able to choose between select Politically biased plans. It’s actually amazing that Toronto residents of Scarborough even get that much choice. Most transit planning public input boils down to picking the colour of paint on the wall, if it’s acceptable to the government. Tory – Needs to let go of Smarttrack and find the compromise. So basically “compromise” means caving into unilateral demands. If Toronto actually funded its transit system properly, opposition to the Scarborough subway would go away. No, it wouldn’t. If we built every pet project, even a “properly funded” transit system would be dragged down. The Scarborough subway is relatively low cost compared to the DRL Long which is almost $10 billion. And a bicycle is cheaper than a pick-up, but if I’m hauling a trailer, I know which is a better investment of money. I don’t like the Sheppard subway, and I don’t like the Spadina extension either, but just because a project is better than the worst idea that’s been built, doesn’t make it a good idea. I would argue the relative placement of Spadina and SSE, as Spadina might offer at least modest relief of Yonge-Bloor, whereas the SSE would make it worse. The one-stop Scarborough subway extension, costed at $2-billion a few months ago and pegged as recently as Friday at about $2.9-billion, will actually cost $3.16-billion. The additional cost is attributed to the price of extending the life of the current transit serving the region and then decommissioning it. … The Downtown Relief Line, which experts have long described as the city’s top transit priority, has more than doubled in price. A high-level estimate has long put the cost of the project at $3.2-billion. Staff say now it would be more likely to cost $6.8-billion. I don’t understand why Steve is making a big deal about a very small increase in the cost of the Scarborough subway when the Downtown Relief Line has more than doubled in cost about which he stays mum. Steve: I have not written the article yet. Meanwhile, the price of the SSE has gone up a huge amount in a very short time. We thought we had “current” numbers when Council was talked into approving the “optimized” plan only a few months ago, but this has proven to be woefully wrong. Basically, it was a “bait and switch” and always has been where we are told the subway will cost only a little more, and the swing votes on Council stay on side to keep peace in the family. As for the DRL, I have to look at the various estimates because they are based on different assumptions about what would be built. In any event, the DRL will have a more substantial benefit on the network as a whole, and there is little by way of alternatives to the project. The SSE is quite another story. BTW thank you (under your many aliases) for finally writing a comment that is not full of insults (or worse). As you know, they are routinely deleted by me. I find these claims that the development of Scarborough Town Centre is being held back by “transit and the economy” difficult to believe. At the same time that STC languishes, and the supposed Etobicoke “city centre” gets a few condos despite being right across from Kipling station, and there is a high-rise city going up at Humber Bay. Looking across the lake from the King car as it approaches Roncesvalles, Humber Bay is already a cluster of highrises that would have handily beat downtown Toronto any time before the 1980s, and there are more towers going up all the time. Yet the economy is the same, and the transit service consists of the 501 streetcar, a local bus to the least-used station on the Bloor-Danforth, and an express bus that’s used by 250 persons per day. There is no prospect of a Prince Edward subway, and no cries that Humber Bay “deserves” this or that. The best it will get in the short term is an extension of exclusive ROW along Lake Shore to Park Lawn, as proposed by the local councillor. As someone in Etobicoke who is a half-hour bus ride from the subway, I find the claims that STC deserves a subway to achieve its manifest destiny to be ludicrous. If it isn’t growing now, it’s not going to grow with a subway station. I will also say that, as a “city centre”, it’s a pathetic car-centric setup that penalizes pedestrians. Its current built form and layout are nothing like what a city centre should be. Maybe that’s one of the reasons holding back its development. For all that we can snicker at Mel Lastman’s “downtown North York”, it is a fairly lively place for people to live, shop, and have some fun. STC, no way. Steve: When I worked at Scarborough City Hall, I couldn’t help feeling the emptiness of the place. The ceremonial drive to the “front” door on the south side of the building was notable mainly for the geese that nested there each spring. “Out back” in the mall between City Hall and the mall, the space was rarely a place people went to, as opposed to going through it to get somewhere else. Only when the ice rink was active in the winter did it attract a regular crowd. Contrast this with NPS downtown which really is a “city centre”. While admittedly little more than something I sketched on the back of a napkin (and in the knowledge Steve isn’t a huge fan of diverting Sheppard) I’m ever more thinking that something along the lines of this is the best combination I can find of political viability, network practicality and financial reasonability. Frankly I’ve tried to support the Scarborough Subway, and don’t like the Don Mills transfer, but this last round of cost escalation really was the straw that broke the camel’s back for me. At one time the whole, original multi-station to Sheppard, project was supposed to be quite similar in cost to an LRT network, and I was willing to say that Scarborough had chosen an arguably inferior but mostly reasonable project. To me it’s hit the point where the subway’s functionality is so compromised, and the cost so inflated, that it just can’t be justified. A properly phased network along the lines of what I’ve mapped and that builds successive phases only when the previous is operational seems to me to address some of the more legitimate frustrations of Scarborough residents. The SRT can continue to operate until the Scarbrough Malvern lines opens in this case, the awkward connections a straight through Sheppard line produced in Transit City are improved (yes, at the cost disjointed service on Sheppard), substantially more of the overall service is brought onto private right of way. I rather suspect that this network could fit within the current budget, possibly with some significant funds left over, and also addresses some operational and long term problems like what to do with the Conlins site (or where else to put a yard) and the in feasibility of any of the supposed eastern extension options based purely on Sheppard. I’d argue that this plan is more appropriate if the LRT lines are viewed as quasi-regional rapid transit rather than primarily an enhanced local service, and while that local service had a good case to be made it’s gained very little traction in Scarborough. THANKS very much Steve, for following all these issues, attempting accountibility and rational analyses, and enabling thoughtful commentings on complex subjects. I’m a downtown cyclist, but we desperately need improved transit in ALL of the region for our GHG emissions, plus the more obvious ones of the congestion, and drain of money being burnt as fuel, etc. So Mr. Duguid, as Minister for enrichment of construction and concrete companies should be dumped from Cabinet, or put in his own billions. Sure, sometimes we need to spend BIG, and we’re a disaster in a few ways (including subways into relative sprawl), but we don’t need any more of the buy-election scheming that has emerged for transit ‘progress’. We are soo behind, we don’t need to sewer the rest of the GTA with Bad Projects; and this Suspect Subway Extension is now a Stupid Subway Extension, though yes, we really do need to boost transit in Scarborough. But we need to dump this sinker ASAP and revert to the funded LRT project, and not have a ‘hurry up and make more mistakes because it’s Transit’ mentality prevaiil, without squeezing the billions a lot more, assisted by a Keep It Simply Surface (KISS) approach, especially where we have existing RoW we already own (more or less). So how impossible is it to have a Smart Spur to STC get done in 4 months, with two shifts?? on the existing RoW? as one example. Why aren’t we doing something right now to integrate Main and Danforth better – there have been plans apparently for decades, though just because it’s been around, doesn’t mean it’s so applicable nonw, and shouldn’t be upgraded/done better. We’re also avoiding things that could be done relatively quickly, and cheaply, because it’d be a ‘roadical’ change, and require political will. Tehran apparently has reversible, rush-hour busways, so why not get a repainting of the Danforth for some near-express buses taking many people from Main or Vic Park area quickly along Danforth to say, Parliament, and yes, make it safe for biking too as bikeway relief is also part of the package, or should be. If it weren’t so dangerous, and if things were maintained/safe, then I’m quite sure that many many more people would drop the Bitter Way and start biking, and this includes not just B/Danforth but also King/Queen, and other core routes like College. Trouble is, the city/TTC make $$$$ from the core to help suburban services, so there’s far less real interest in competition. I’m also still keen on using that very long and very wide Gatineau Hydro corridor that slices through all of Scarborough from 401/Zoo area to Vic Park/Eglinton. We still own it, and by boosting transit (and only transit) on the off-road diagonal, we lessen resistance to transit boosts while expediting it, especially if it is more of a sub-regional service vs. milk run. We could think of 401 relief, and GO buses using it too, and also could think of extending any transit over the Don Valley to the Thorncliffe Park area, which is a very heavy transit use area I believe, and if we manage to ease demands from this area, that might be significant to ALL of the system. This includes using two existing/owned-by-us linear corridors from the area to the core: one being a rail line/bridge from the Brickworks south beside the Don River/DVP, but also the DVP itself. As the DVP is a gift to motorists, we really should be having the highest/best use of this corridor which is for transit, and I think there’s enough room for a continuation of a rush-hour but reversible RofW for a busway to near-core – if we had imagine, if we had EAs that really looked at problems and options, and if we had a planning process, and not schemings. We tend not to think of bus transit in busways as being “good”; and it can be less-okay, but in areas where we don’t have enough density, and where we need to do something QUICKLY, which is what our trans*it kinda needs, right? – maybe this is part of the solution, and could be a surface DRL in five years, and for far far less money. Where we need the heavy investment is in a neglected part of the core, the west end near-waterfront, where there have been serious plans for about a century I think. There’s a natural pinch point at the base of High Park and the Lake, so ALL of the east-west demand in to the core has to filter through here, so it’s well past time to set up a sub-regional/faster TTC service that would help Etobicoke, Parkdale, Liberty Village, and the near-core – and I’m very keen on restoring transit to Front St. as the core segment, and NO road in lower Liberty Village but a transitway instead with c. 3 stops, as the area is isolated. The disaster of the SSE and the tainting of politricks to the planning processes and budgets means we might maybe see yet another inferior ‘fix’ that costs a lot, but it isn’t very good. The good news with the SSE exercise is that it may have spawned a couple of terms – Clowncil and Clowncillors – soo obvious, how could they not be in circulation sooner/elsewhere? Now to be inspired for a similar term for Mr. Dubad…. and this effort isn’t adequate. The UTDC was a provincial agency that concocted the RT technology, and they couldn’t get a sale if Toronto wasn’t buying. This technology is most emphatically not LRT, no matter what Duguid and others like to call it, for the simple reason that it requires a completely segregated right-of-way. Well who gets to decide whether sensible observers get to call a system an LRT, an “intermediate capacity transit system”, or a “full metro”? Those who run it? Those who paid for it? Or us sensible observers? Steve: The boffins at Queen’s Park called the RT “Advanced LRT” to give the impression it was a natural evolution up from a streetcar, when in fact it was a degradation of “subway” intended to allow lower cost implementations. It didn’t quite work out like that. I visited London, in 1996, and rode the “Docklands Light Rail” from somewhere near Trafalgar Square to the site of the old Naval College. It was a beautiful system. The portion I rode was almost entirely underground. It was just like a subway, only smaller. What about Boston’s Blue Line? It too is very old. A key portion of it is a long tunnel, under the harbour. That tunnel, or pair was built to carry streetcars. This is why Blue Line trainsets use shorter vehicles, that aren’t any longer than streetcars. According to the wikipedia’s article on the route, in 1924, when it was converted from single streetcars to trainsets of heavy-rail vehicles, its trainsets were only four vehicles long. Its stations were only four vehicles long. The Blue Line vehicles are only six inches wider and half the length of a flexity vehicle. When the Crosstown is running with full-length trainsets it seems to me it would have more capacity than a Blue Line trainset. Should sensible observers feel entitled to characterize how systems are classified? Steve: That is entirely the problem: people use LRT to mean different things. A “Light Railway” is British term referring to the use of smaller trains than mainline railways and lighter infrastructure, but the DLR implementation is totally automated and grade separated. The whole point is that LRT as it is actually implemented all over the world does not require this level of segregation. The Boston system is a good example of the flexibility of implementation all the way from underground trams to street running (albeit very little of that left), and it forks into 4 routes, one of which runs in an old railway corridor (D Riverside) and is completely grade separated. But passengers walk across the tracks at stations (try that on GO Transit). STC needs to be well connected to where? Is a transfer that is easier, and faster than the ones at St Georges or Yonge/Bloor really that much of an impediment, if it means having out of traffic transit much closer to your door. To me looking from afar, I would have thought that connecting the STC to the residents of Scarborough, would be a higher priority, than connecting it to downtown. If it is to be more than a hub for buses, then making it the terminus on a subway that flows mostly west would seem to serve little purpose. The second, well, if the transfers are actually designed as cross platform, then an LRT network, should actually provide more riders more benefit. If we are going to even think about raiding Eglinton East, we are saying in essence we will forgo, transit service and convenience in the name of having a subway, as opposed to having actual service. You are actually forcing a worse transfer on more riders, by creating a single stop system, with a long connection, because the TTC will turn trains at Kennedy, and many riders will have to ride a bus to infrequent subway, or between bus routes, that would otherwise be able to board a frequent LRT to frequent subway, or directly to destination. Downtown & the main transit artery seamlessly to have any hope of being a growth center. Yes. We have enough transfers and we need to make it easier to commute to better jobs and access out City Center not harder. We need to make it easier for business to use SCC as a satellite center and isolating does not help whatsoever. The optics are bad Selling it as a quality transit hub is almost just as bad as it is now with the RT. “Experts” need to stop using current travel models for a system people refuse to use except those that have to and work locally. We need to be connected seamlessly to the City. There is no rocket science needed to converted the RT corridor into a subway. But it was easy to say no before because it would have cost more the SLRT. So instead segregated City was rejected and 3 billion is what we have to pay unless a compromise can be made. I ask you is it that hard to get over the LRT technology to STC and focus on connecting the subway that would certainly benefit STC’s future? Hi Steve, I saw you on the CBC news last night. On today’s news regarding transit projects, five projects costing about $15 billion were listed: SmartTrack, Eglinton LRT extension west, Eglinton LRT extension east, the DRL (short version to Danforth), and the SSE. The DRL accounts for nearly half of the total cost. However, that is commensurate considering that this a wholly new subway route. 2. If you have a parking spot at home, you aren’t being taxed on it. But $1.50 to $3 a day is not a heavy toll. 3. It takes from private vehicles and gives to public transit. I was in the north-east Scarborough – Markham area yesterday at around evening rush hour taking someone to the hospital, and we were stuck in horrible traffic jams trying to head northward or eastward. Every car occupied by a single person. As I understand it, the Scarborough Town Centre exists because the Eaton Family had some land that they wanted to develop and decided to build a shopping mall. There is no historical or natural reason why this area should be the centre of Scarborough. The built form is not pedestrian friendly at all. Surrounding office buildings are reached by car with wide roads and distances between buildings preclude walking. 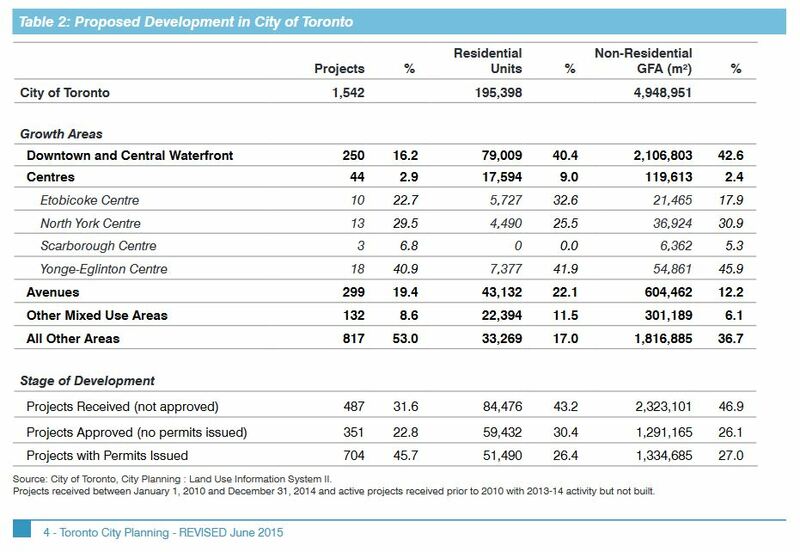 Your chart shows 3 projects underway with none of them residential. There is nothing to suggest that this area is or is going to be a true civic centre node. Density in the surrounding area is low and the present and future traffic patterns do not support a subway. Polls actually taken in Scarborough reveal that the support for a subway is not overwhelming. There is an awful lot of Scarborough beyond STC and this politically inspired vanity project will do nothing to serve that populace. Other than the fact that a certain group of politicians have inspired a vocal group in Scarborough to believe that they “deserve” to squander all the transit spending of a generation, this project has nothing to offer. Northern Etobicoke, North York (it is a bigger place than Yonge and Park Home) and yes, much of Scarborough (beyond STC), are also transit deprived. This plan does nothing to address this deficiency and yet it monopolises all of the resources that could provide relief to these areas. Now John Tory is looking for “Revenue Tools” to fund this madness. It’s time we said enough. I am proud to pay my taxes and am happy to see the proceeds spent for the good of our society – not just for my personal gain. However, I think it is time to take a stand. Speaking only for myself, I am not willing to pay taxes to see them wasted on an unneeded boondoggle with only one purpose – to put salve on a sense of grievance that was whipped up by uninformed populist politicians. Others may agree and I urge them to speak up too. We need visionary transit for all of the GTAH. We have neglected transit for a generation (maybe two) and the catching up will be painful and will take a while. However, it is a necessary project where we all need to work together for the common good. It will be expensive, and we will need “revenue tools” to make it happen, but a balanced and fair transit system for the whole GTAH is possible. It is time to move on to the real project. For the record – I do live in an area with good transit. However to me, that is a bus and a streetcar. I rarely use the subway. There is one group, namely Tory and the Provincial Liberals, who are demanding subways and nothing else. Then there is the other group that wants LRT to salvage the David Miller legacy. Then there are the planners who fudge their numbers to suit whichever of the above two groups have the power. The problem is that nobody is trying to find the best solution. Four years ago, Metrolinx found the best Benefit/Cost ratio with the connected SRT and Eglinton line. For political reasons, that was abandoned. It was a case of defeat Ford at all costs, and now we are paying those costs because Ford happened to stumble upon the best solution. The worse part is that the same thing appears to be happening on Eglinton West. The recent preliminary benefit / cost analysis showed that the best solution is a fully grade-separated line. The conclusion of the report was to abandon this and pursue the on-street version with a few grade-separations at intersections. That report tried to handicap the fully grade-separated option by only considering 6 stops, even though the text states that 11 stop is optimal. Are you planning on writing about this? Steve: Yes, I will be writing about all of the reports that have just been released, although as you know I do not agree with your position that full grade separation is required. So why would they use SCC as a satellite centre when automation is providing ever greater opportunities for businesses to downsize their workforce and SCC has no advantage when it comes to telecommunications infrastructure or greenfield sites? “Yes. We have enough transfers and we need to make it easier to commute to better jobs and access out City Center not harder. We need to make it easier for business to use SCC as a satellite center and isolating does not help whatsoever. The optics are bad Selling it as a quality transit hub is almost just as bad as it is now with the RT. The thing is Joe, that the majority of the trips taken in Scarborough are within Scarborough. You are likely not reducing the number of transfers involved for most commuters, and are imposing in traffic trips on some commuters that would otherwise be out of traffic. The argument that you made previously against Transit City, that to me made some sense, was the fear that it would simply be partially built, one line, or perhaps 1.5 and then stop. Here I believe you would have a valid point. However, the transit system needs to be designed for more than just core bound trips. The issue with transfers, to me, appears to be one of being either ridiculously designed ones, like at Kennedy, or ones with extremely infrequent services, or unreliable services connecting. If the operator manages headway well, LRT should be a high quality service, however, this is other legitimate concern that all can, and perhaps should have, is headway management. This is the major issue within much of the TTC system, and is one reason why I can understand many facing long commutes to be especially sensitive. The one thing I can understand driving this, is if I can have 1 bus ride, to reliable subway, at least I am only exposed once to long waits. Headway management, is one of the things that the TTC, and planners need to address in any move to rapid transit, as well as in just regular transit. Seeing 2 buses or streetcars pull out back to back, is very frustrating. Having 5 buses arrive/depart on a single route in 10 minutes when you know there are only 6 in an hour is very frustrating. This will be worse, when you are talking vehicles that can hold 270 or more going by empty trailing directly behind another packed to the gills, especially when you know that this means 20 minutes to the next.